I had originally planned to use my PAWS custom mixed water marbling polishes for this prompt, but the 31 Day Challenge is called a challenge for a reason, so I decided to use another brand of polish to see what I could achieve. 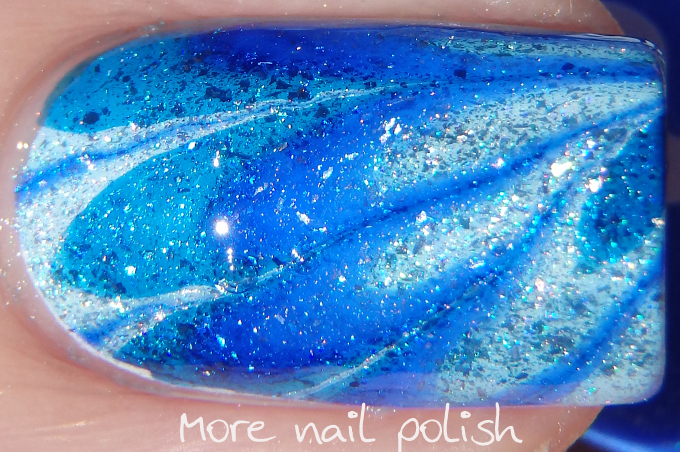 I just received the new Picture Polish collaboration shades in the mail and I was looking at how Forget Me Not compared to the other Picture Polish blue scattered holos, then I realised that these polishes would look pretty amazing all in a watermarble together. 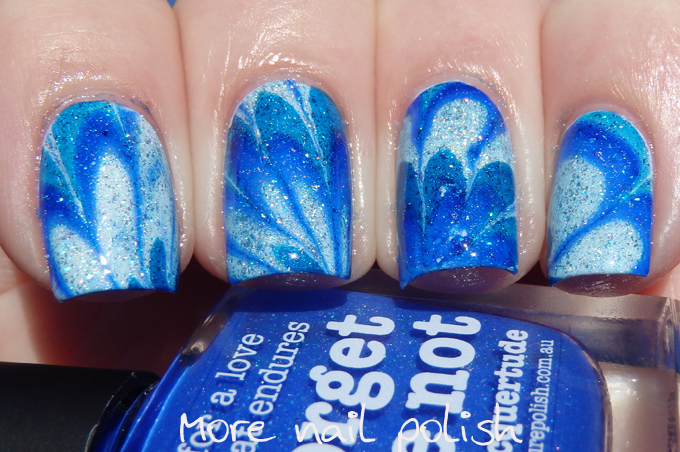 I used Picture Polish Cosmos, Freya's Cats, Forget Me Not and Bette, marbled over a white base. My thumb and my middle finger turned out with the best patterns on them, but I still loved the overall effect of this marble. 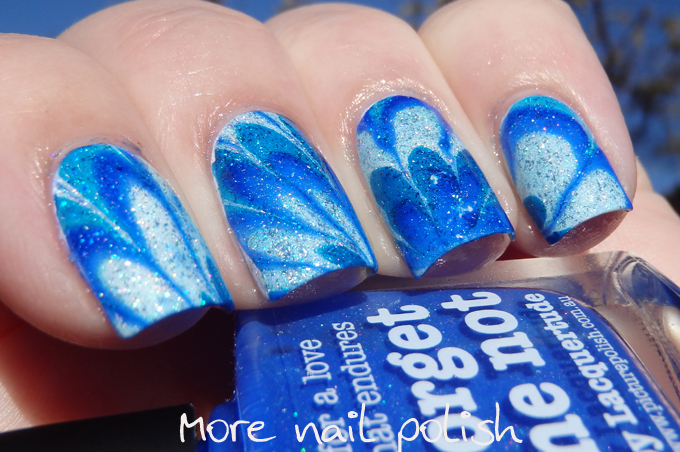 The blue polishes are so vivid and bright and swirly, and the holo shards in the polish really sparkle! My Water marble nails from 2013! 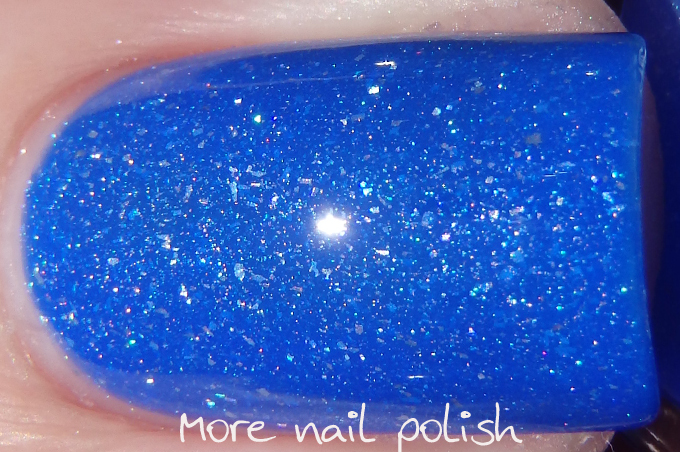 Here are some bonus swatch photos of Picture Polish collaboration shade Forget me not, created with Kate from Lacquertude. If you have ever visited the Picture Polish website, you would be very familiar with Kates perfect fingers and nails, as she does all the swatches on the picture polish website. Forget Me Not is a shade lighter than Freya's cats and was nearly a perfect match to the deep blue sky in the background. It is a bright blue jelly with scattered holographic particles. This is two coats with Seche Vite top coat. 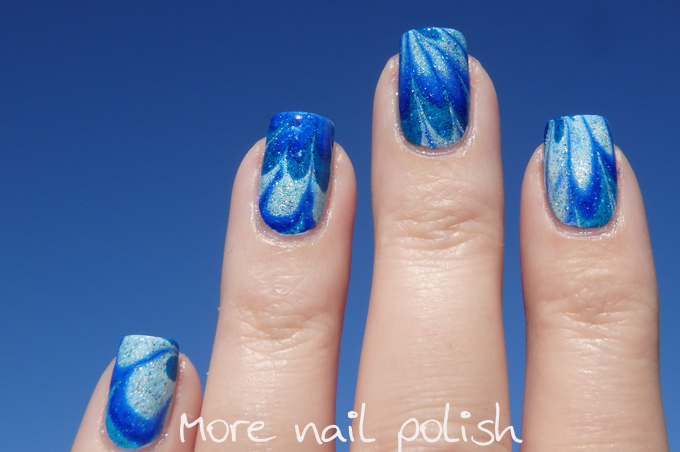 I appreciate the effort that goes into consistent patterns on all nails with water marbling, but I like this random effect too, something to like about each one. These look amazing, great job! 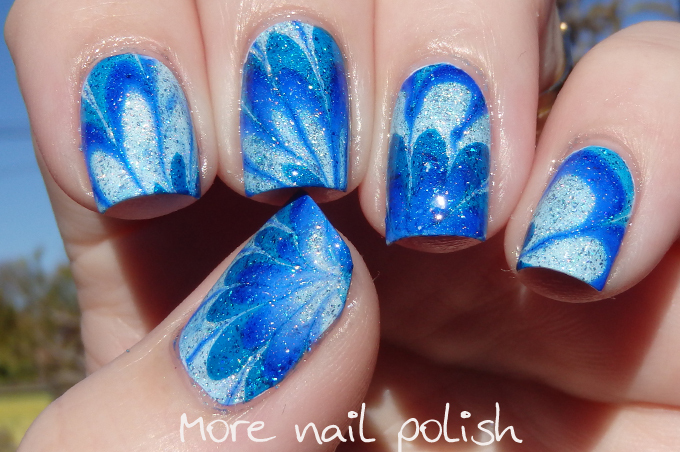 Gorgeous watermarble! Did you huge a holographic top coat or is that the polish themselves? Each polish has the holo particles, so it's not a holo top coat.